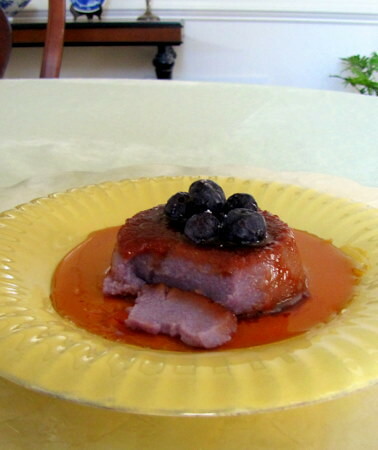 Ube Flan ~ I Can Do That! 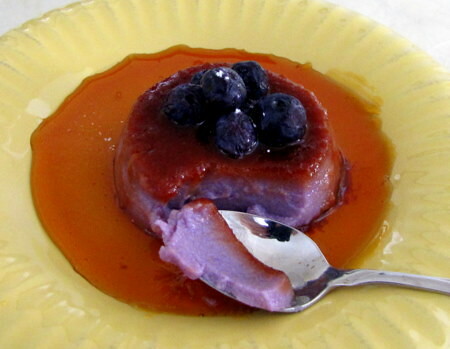 If you are an ube (purple yam) fanatic like myself, you'll love it in flan. It makes a deliciously smooth and delightful dessert specially with a few pieces of slightly tart fruits like blueberries or strawberries. The recipe is a basic ube flan but you can adjust the amount of eggs without major alteration to the consistency of the flan. Caramelize the sugar and pour into 4 or 5 ramekins or a llanera mold. In a large bowl, slowly add water into the jam and mix until mixture is smooth and has no visible lumps of ube jam. Add the beaten eggs and milk and mix well. Strain into the prepared ramekins or mold. Steam in rapidly boiling water or bake in a bain marie at 325°F oven for 1 hour. Refrigerate overnight before unmolding. Glad to be back to see all your yummy dishes ! Too bad I can't taste ! Look at the pretty color! hi oggi - that ube flan looks amazing! i love ube (anything ube actually) and this seems to a great combination...all i need is some ube jam and i can make it this weekend! by the way, i missed my opportunity to meet JR Celski a few weeks ago. He was in San Diego and was hanging out at a friend's house (this is the guy who owns and runs PNoy Apparel)...i didn't go because it was potluck and i was stressed out because i couldn't make what i wanted to bring (not enough time to get the ingredients and whip it up). aaaargh! Your website is amazing. You really are quite a visionary in Neo-Filipino cooking. I love it all, especially your posts on Ube.